Micromax Canvas 4 is the most recent discharge a device from the house of micromax, likewise its the most unmanageable (too much expensive!) phone by micromax cost arround 17 thousands. Despite the fact that it take as a high end phone yet there's nothing unique in it, I mean the Canvas HD is having almost same specifications, then why to buy this expensive device. Its only a device with same specifications as of Micromax A116 Canvas HD which is 'blotwared' with some apps like air screen, unlock, air gestures and so forth. The performace of the device is also almost same like of Canvas HD but after rooting the device, you can increase the performace of the device by using some applications and mods like Greenify, King's Booster, Seeder etc. but note that there will be not too much effect on the device because they will just increase the raw performance. Even rough performance is good means it can remove some lags while playing games and multitasking. First of all, let's see the specifications of this device. The specifications are good but I think the price point (17 thousands) is too much for this device. You can get the same device with same specifications at cheap rates from Karbonn, Lava, XOLO etc. but nothing too bad about this device, you cannot get 5 Mega Pixels front camera which can record 720p HD videos etc. 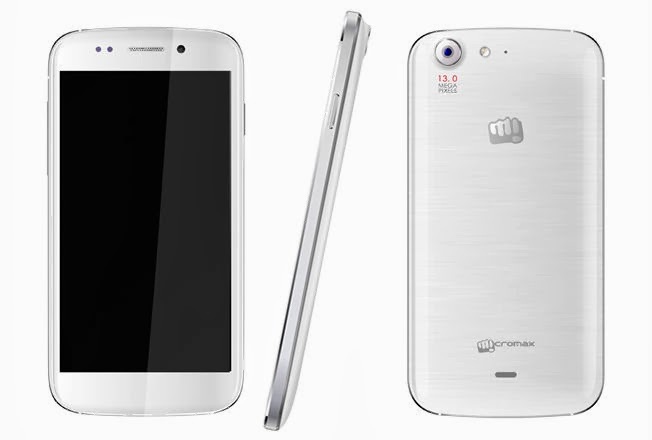 Don't try this rooting guide on any other device except Micromax A210 Canvas 4 because it can brick your device! Don't mix any other guide with this guide, I mean follow this guide only. Don't remove the cable while the process. Before trying this guide, make sure your device is charged up to 70%. Turn ON USB debugging : Go to setting [from the application drawer] > About Phone, there scroll to the last and you'll see a About phone section. Open it and tap 7 times continuously on Build Number to unlock the Developer Option. Now back to setting menu > developers option > USB debugging > Turn it on. Download the MOTOCHOPPER rooting toolkit from the link given above. Extract MOTOCHOPPER in any folder [Say Desktop/Rooting]. Connect your Canvas 4 with USB. Install PDANet and install it by following that guide. Open the folder in which you extracted those files. Right click on the file named RUN.bat and select Run as Administrator. Now a black window (command prompt) will open with some text which will be about who made it and all, so just press Enter. Credits goes to me for capturing this picture. It will root your device, don't remove the USB cable untill it's finished. After the process completes, reboot your device again. After the reboot, you'll see a new application installed in to your device [in application drawer] named Superuser. If you found it, then you're rooted. Not sure if you're rooted or not, then install and check by Root Checker application. You can download it free from Google Play Store.